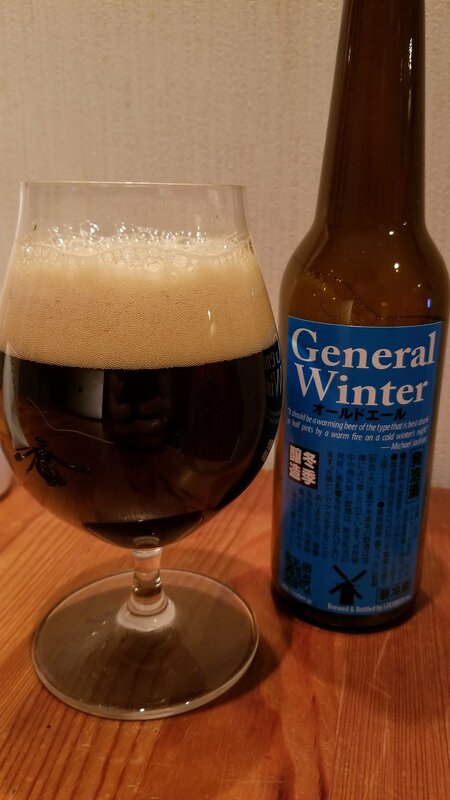 Locobeer General Winter is a 7% old ale from Locobeer, based in Sakura city, in Chiba, Japan. It’s part of their winter lineup and can be found in both bottles and on tap. Locobeer General Winter poured out a deep chestnut brown colour with a plump off-white tan coloured head. The head faded to a few bubbles around the side with a light oily slick on top. Locobeer General Winter was all about the malts – rich caramel with some hints of dried fruits, such as raisins and plums. At 7%, I expected some alcohol heat to come along when Locobeer General Winter had warmed up, but none did unfortunately. Letting Locobeer General Winter warm up is essential if you want to get the most out of it. The nutty caramel flavours only really came through once it had time to warm up, along with the dried fruits. However, it still lacked some oomph – some va-va-voom – for something that, and to paraphrase Michael Jackson, should be “a warming beer to be drunk in front of a fire”. Locobeer General Winter finished off with more of the malts and dried fruits. Locobeer General Winter is a solid old ale but lacks oomph and body to make it an essential try.